Maybe it’s the recent unveiling of his true identity that spurred all this activity? Whatever’s the cause, you’ll never hear me complain about more K.J. Parker on the shelves. The setting for Savages, as for most of Parker’s output to date, is once again a vaguely recognizable (but really different) parallel of Europe during and after the breakup of the Roman Empire: there are Western and Eastern Empires, one with vaguely Roman-sounding names and one with kinda-Greek-sounding names, as well as some other parallels to countries and regions in historical central Europe. Fans of the author will catch references to, among others, Permia and Scheria, two countries that have frequently been featured in Parker’s fiction. The Library at Mount Char by Scott Hawkins is one of the biggest surprises of the year for me so far. A contemporary fantasy novel with strong horror elements, it sets up a wholly original fictional universe, complete with mythology going back tens of thousands of years. It’s easily one of the best novels I’ve read all year, and one I’m 100% sure I’ll reread at least once. Carolyn is one of twelve children who were, at one point, regular small-town American kids, until Father took them in and made them his Pelapi, a word that means something like “pupil” and “librarian” combined. Father is a millennia-old deity who has collected the sum total of his knowledge in a huge Borgesian library, divided into twelve “catalogs” that each cover a subject like the gift of languages, war, time travel and so on. The children are each assigned a catalog and so, studying the arcane skills of Father, become incredibly powerful beings themselves. One can revive the dead, another can travel into the past and the future, and yet another becomes a practically invincible warrior. Congratulations to both winners, and many thanks to Linda Nagata for providing these wonderful prizes! For those of you who didn’t win, stay tuned as I hope to have several other great giveaways coming up soon, as well as the usual slew of reviews and SF/F-related ramblings! Rejoice, fans of intelligent, passionate, character-driven historical fantasy. 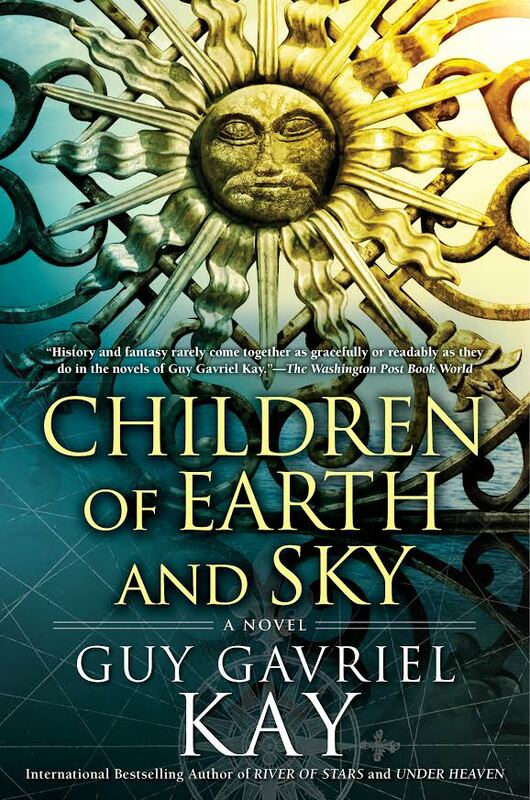 Today Penguin Random House announced Children of Earth and Sky, a new novel by the great Guy Gavriel Kay. 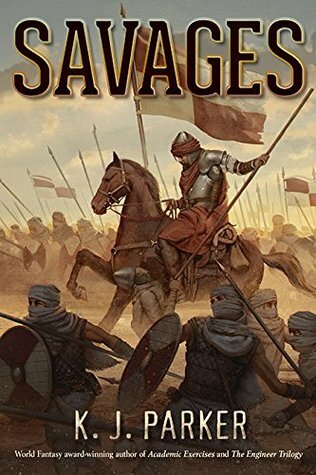 I’ve been a huge fan of Kay for, well, decades now — ever since I found myself in tears on a New Jersey Transit train, reading The Lions of Al-Rassan. He’s one of very few authors whose books I buy on sight, in hardcover, on release day. Below the cut, you’ll find a larger image of the cover and the novel’s synopsis. Elsewhere on this site you can find my review of the author’s most recent novel, River of Stars, an excerpt of that novel, and an interview I conducted in 2013 with Guy Gavriel Kay. K.J. Parker’s newest venture is a serial novel entitled The Two of Swords. Orbit will be releasing a new installment every month — the first three were batch-published in April, and so far a total of six are available, the sixth and newest one just released today. I don’t have exact word counts, and the installments vary somewhat in length anyway, but they feel like short-to-medium novellas — the kind of thing you can read in a few hours. At $0.99 per installment, they’re a great way to get a monthly dose of Parker without breaking the bank. Giveaway time! Thanks to author Linda Nagata, I have one hardcover copy of her excellent new novel The Red to give away, as well as one Audible code for the audiobook. If you’re not familiar with this Nebula-nominated novel, go check out my review here. You can also find a guest post by author Linda Nagata here. To enter the giveaway for the hardcover, simply send an email with subject line “RED” to fbrgiveaway AT gmail DOT com with your full name and mailing address. To enter the giveaway for the audiobook, send an email with subject line “RED AUDIO” to fbrgiveaway AT gmail DOT com with your full name and mailing address. Feel free to enter for both, but you can only win one of them (determined by a random drawing) so choose carefully! One entry per person per option please: multiple entries for the same prize will result in immediate disqualification. However, please feel free to tell your friends, and following/liking me on the Twitters and/on Facebooks is always appreciated, should you feel so inclined! Please note again that, at the author’s request, this giveaway is limited to the US only. The giveaway will end on Thursday, July 16th at 11:59 PM. Void where prohibited by law, rules are subject to change, harmful when swallowed, and of course, batteries not included. Bunch of cheapskates.